Thirumeyyam is a small town situated on the National Highways 210 on Thiruchirappalli - Rameswaram road. 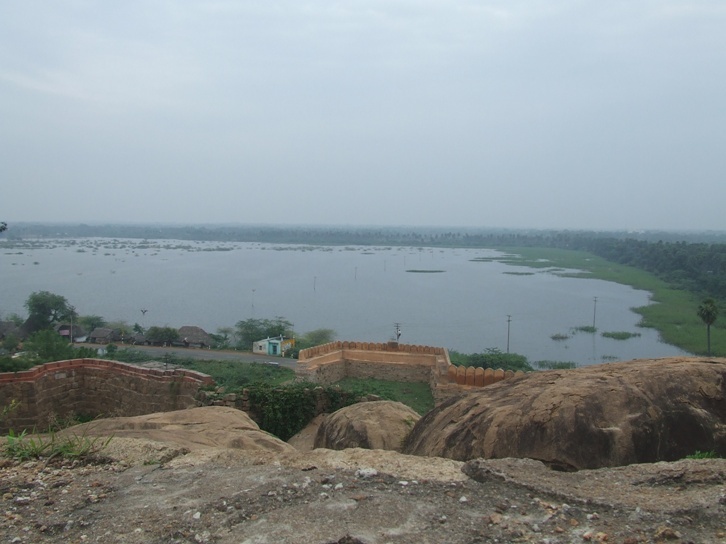 It is about 20 kms from Pudukkottai and lies on the Pudukkottai-Karaikkudi route. The Madurai road takes its diversion from the NH 210 at Thirumeyyam. 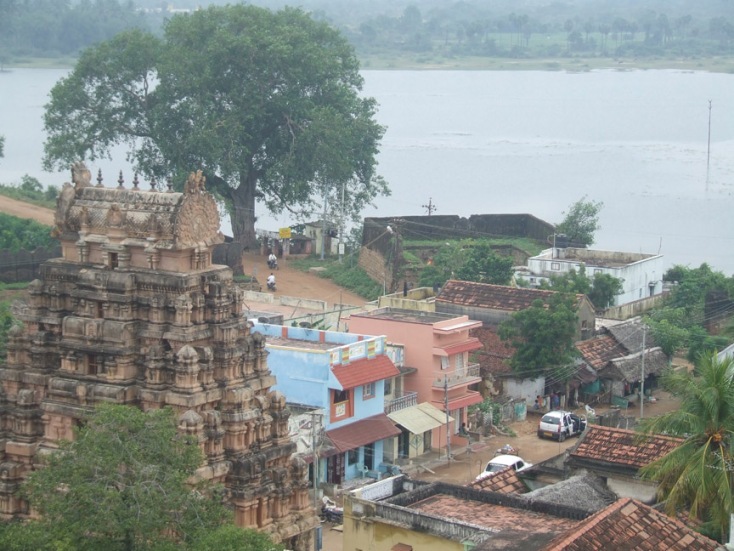 It is a town panchayat and also headquarters of the taluk. 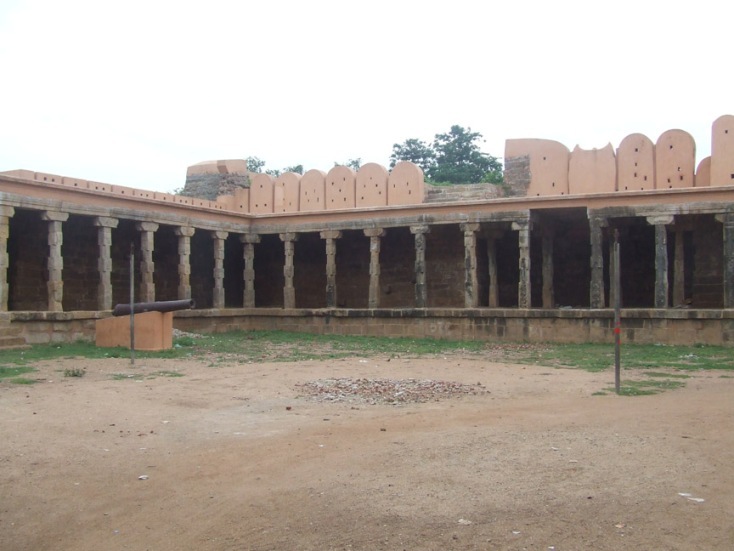 It is also one of the headquarters of Archaeological Survey of India and nearly forty four monuments are under the control of Thirumeyyam unit. 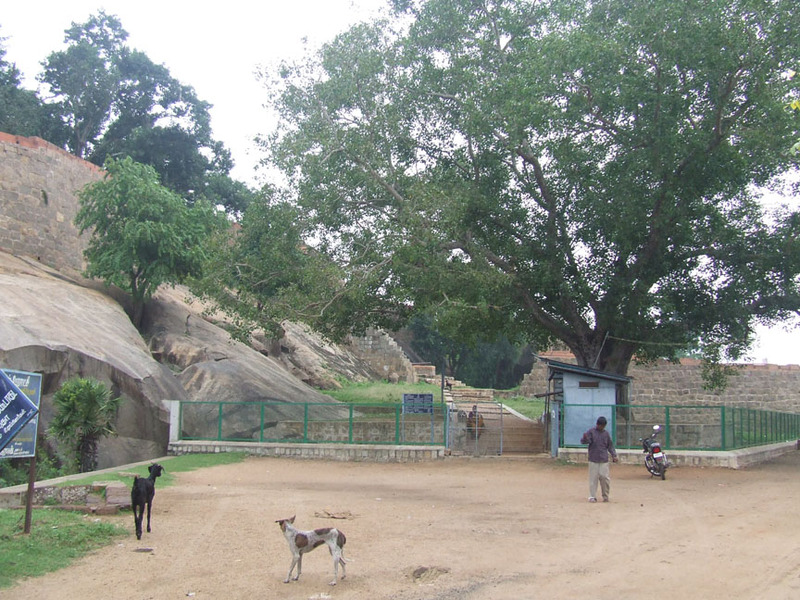 Thirumeyyam is a much frequented tourist spot and the main attractions are epic centered on the hillock. The celebrated monuments are the Fort above the hillock and three rock-cut temples of Siva and Vishnu hewn out on the southern side of the hillock and the shrine cell on the western face of the hillock. 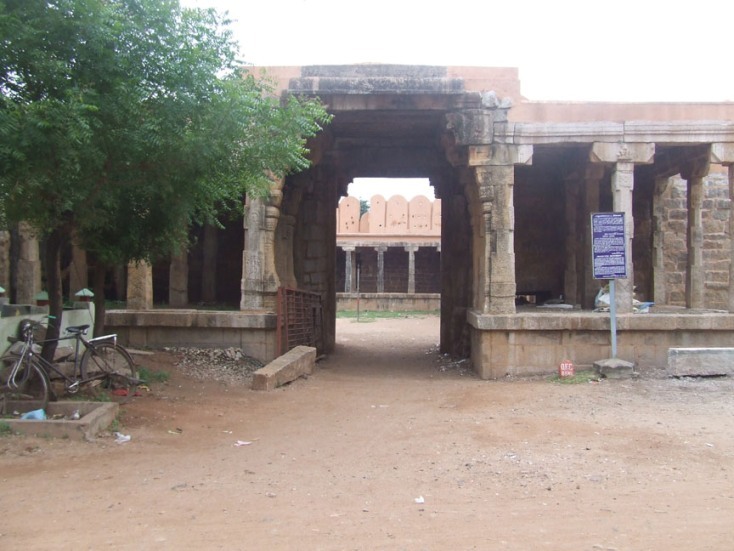 The other sites of minor interest are the Pidari temple, Muniswaran temple, mosque, tombs of Muslim saints, and a Church. The first approaching site of the town is the hillock from where nearly 1 km to its south and southwest lies the main town. Lush green fields spread to the east of the hillock and huge tarns called the Thamarai kanmai, Alankanmai, and Thirumeyyam ooruni are also found around it. Encompassed with all picturesque beauty the hillock with its fort stands majestically in the middle. 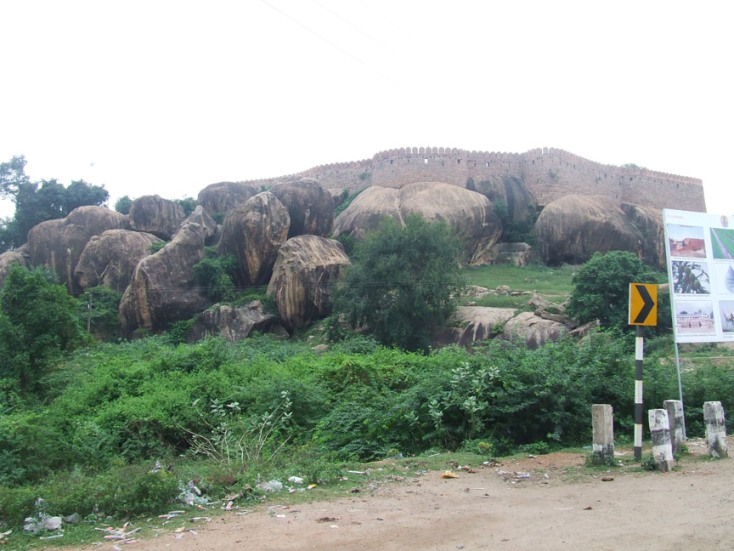 The highway, which is a long stretch of straight road in front of the hillock made the fort conspicuous even from miles apart. Exactly at the starting point of the fort the highway road takes a right angle diversion towards north. 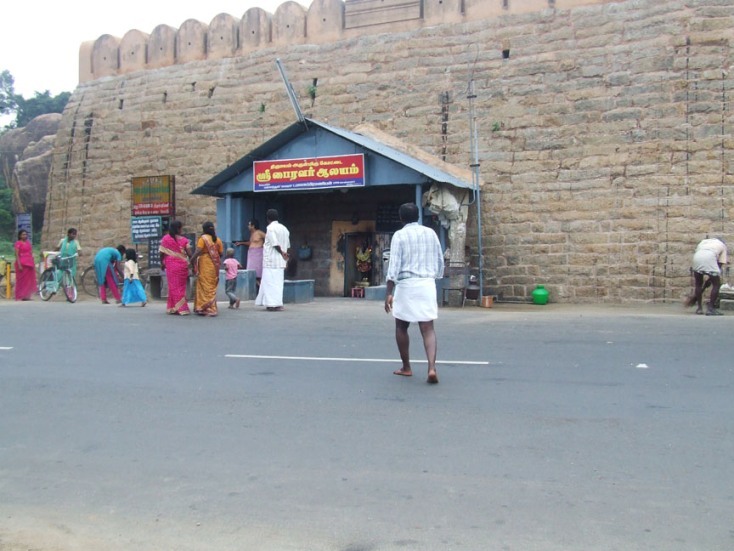 A small shrine for Bhairava is seen on the outermost wall of the fort facing the main road. 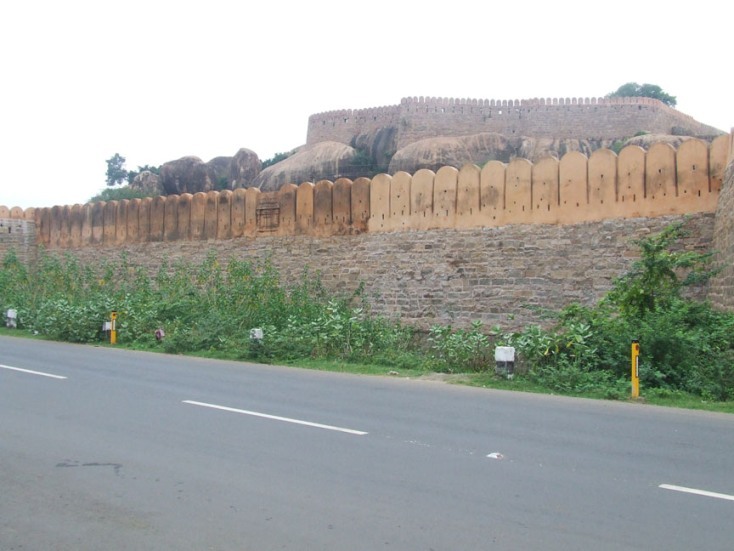 Actually the outermost wall is a fragment of the outer ring of the fort. It is the favourite diety of vehicle owners who halt and pray for their safe journey. 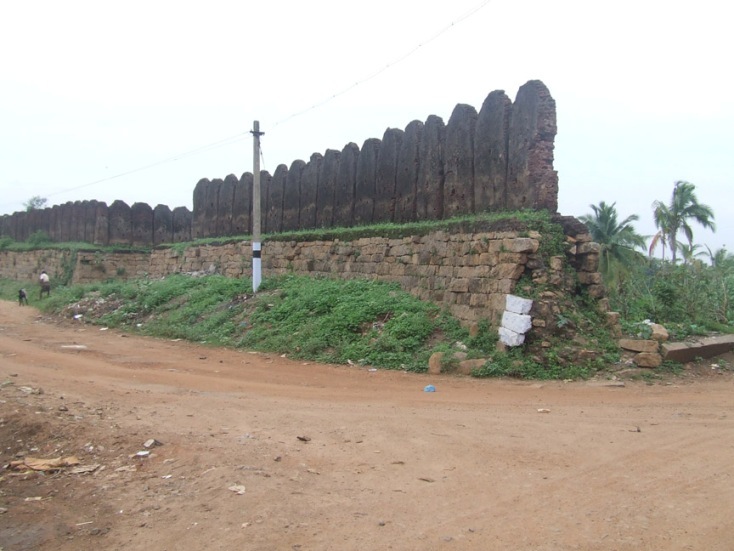 A pathway from the main road adjacent to the outer most fort wall leads us to the fort. 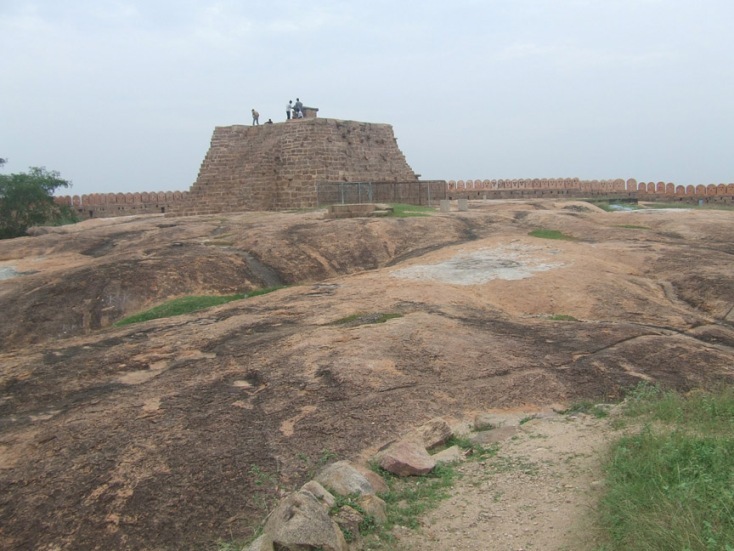 The hillock in which the four monuments lie is huge and spread to a vast area. The passage of time and cruelty of nature made the hillock as separate shingles around the base. The northern and the western sides are sloppy whereas on the southern side the hillock is raised to a huge height like a cliff. 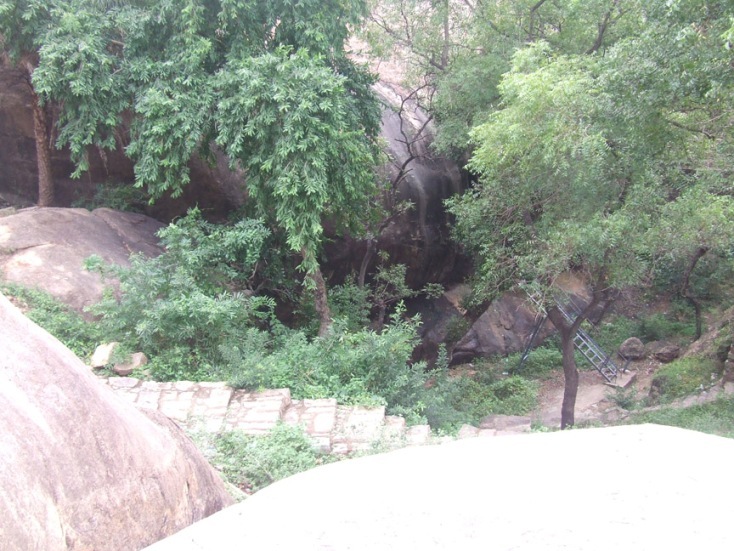 In the southern precipice the two rock cut temples of Sathyagiriswara and Sathyamoorthy dedicated to Siva and Vishnu respectively are found. Through epigraphical evidences it is proved that the Siva temple is older than the Vishnu temple. On the west precipice of the wall the shrine cell dedicated to Siva is seen. And at present the fort is centered on and above the hillock and only three concentric walls are seen. 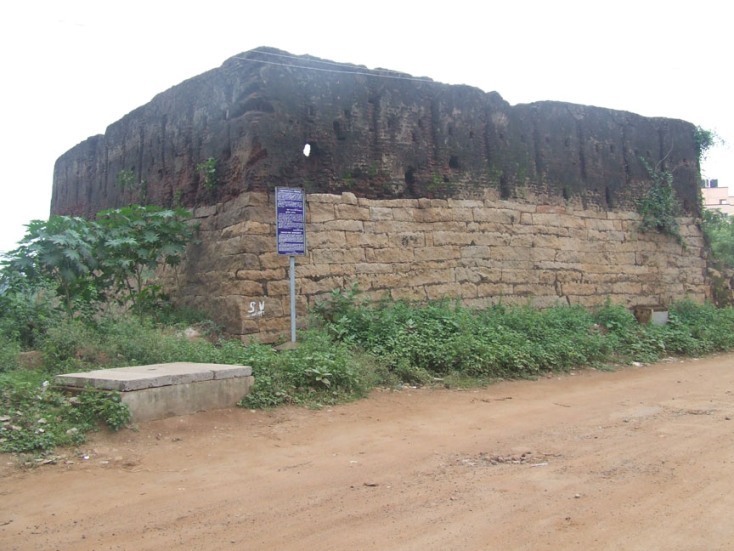 According to Dr. Raja Mohamed, Raghunatha Sethupathi, of Ramanathapuram, constructed the Thirumeyyam Fort. In the 18th century it was ceded to Raghunatha Raya Thondaiman of Pudukkottai for his military assistance to the Sethupathy. 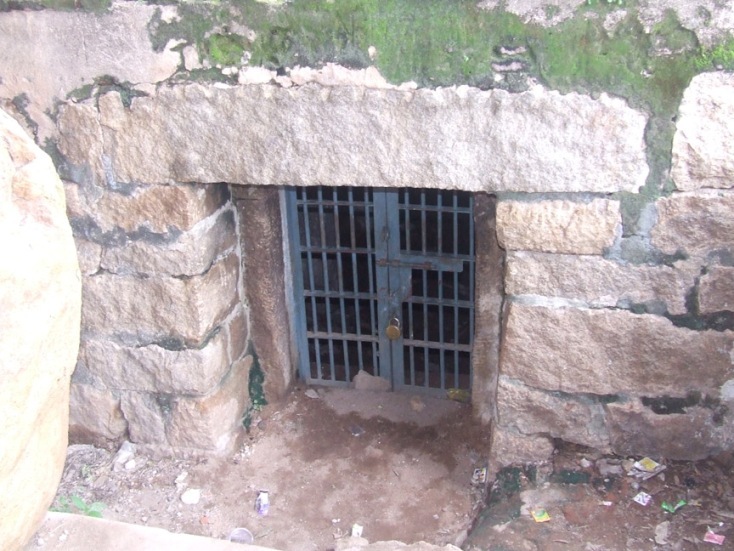 There is also an unconfirmed tradition that Kattabomman and his brother were detained in this fort by Thondaiman before being handed over to the British. The old fort is also a noteworthy structure to speak. It is seen in patches around the village centering the hillock with its main entrance in the southern side. The remnant patches suggest that the fort might be in ring like shape with machans at consecutive distance and entrance on three sides. The vestiges of the structural gateway even now stand majestically in the south. Unlike the northern entrance, which is a deserted place, the southern entrance is a busy place with floating population. 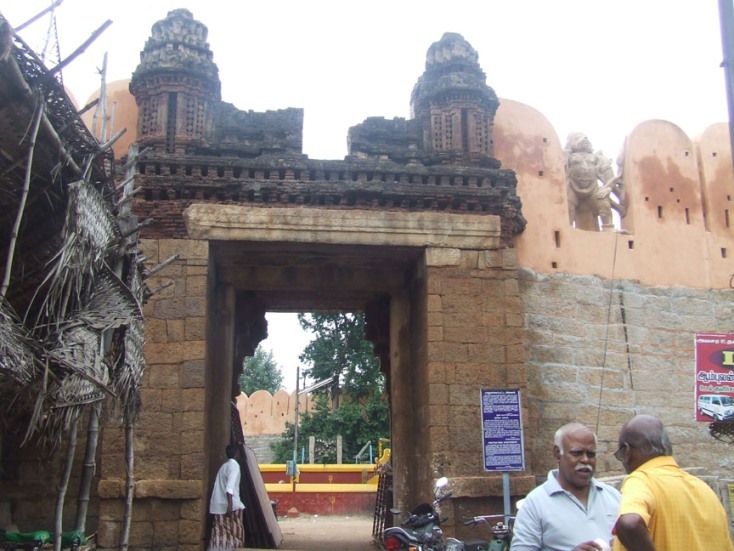 If one enters the gateway can reach a courtyard where a temple for Muniswaran is seen. Immediately on the west another gateway is seen which leads us to a quadrant shaped pillared corridor with an open courtyard in the middle. Canons are most prominently seen around this area. The present fort, which is centered only on the hillock, has its main entrance on the northern side where a booth of ASI department is seen. Iron fencing is made around here. The milieu with a small tarn and a huge banyan tree adds tranquility to the place. The fort has three concentric walls around it. 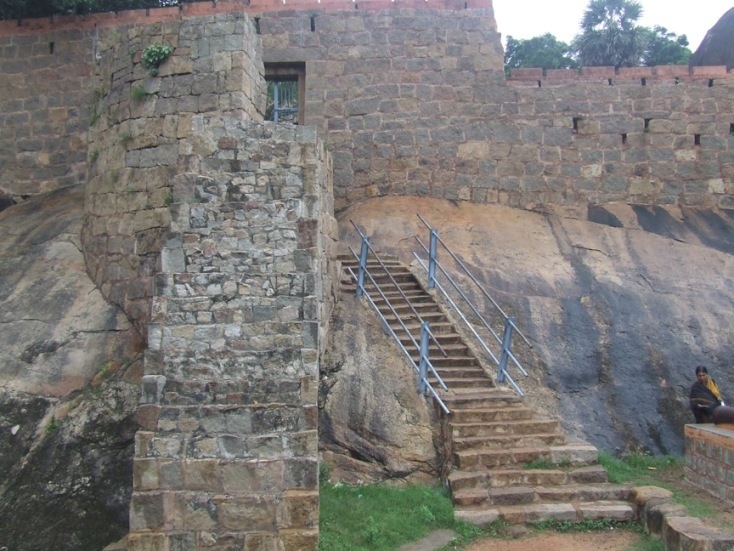 One can reach the second echelon of the fort by climbing the rock cut steps. In the second stratum huge rock shingles are seen on the left whereas to its contradiction steepness is seen on the right. 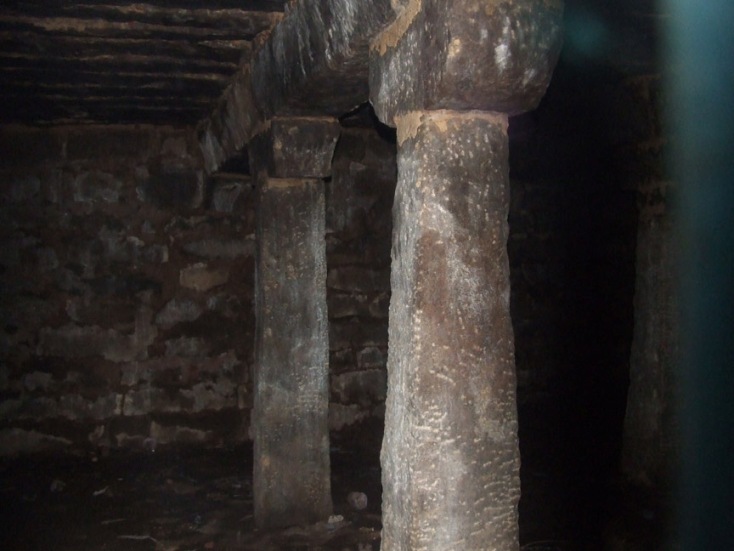 A pillared chamber that might be used as a magazine is also seen here. Behind the chamber on the precipice of a rock boulder a rock cut cell is seen. It consists of only a Linga cut out of the mother rock. To reach the shrine cell one has to step down nearly 60 stairs on the steep slope and again to climb the iron ladder. The rock cut cell has an aperture towards east and is 2.74 mts in east west and 2.93 mts in north south directions. The doorframe possesses a lintel and jambs and its height is about .90mts and width about .48 mts. 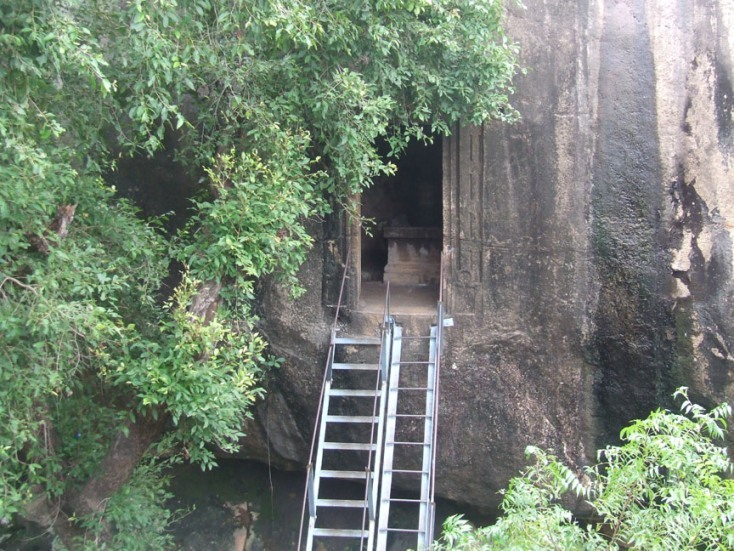 In the center of the cell is seen the rock-cut Linga with square avudaiyar and rudra bana. The avudaiyar with a height of .65mts and .90 mts in length and breadth is decorated as a upapith. The top surface of the avudaiyar is scooped out to a depth of 3 inch and the bana to the height of .59 mts is seen in the center. 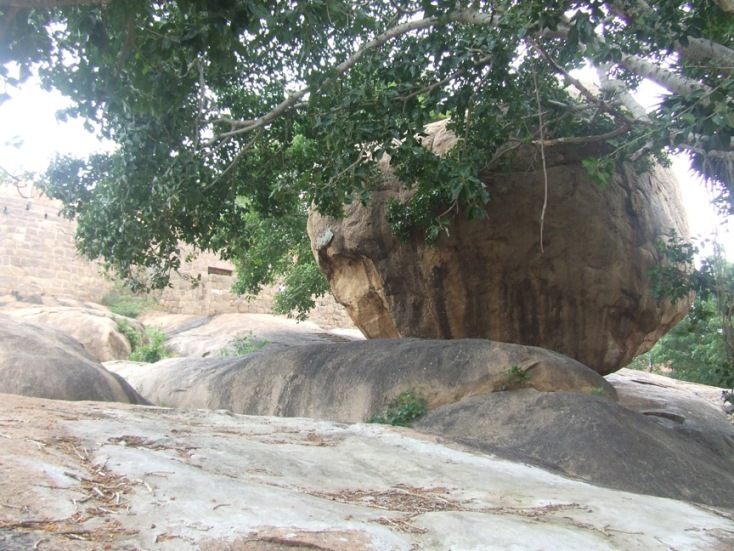 A small gomukha bore by a gana is seen on the north. Under the gomukha is shown a pit to a depth of .47 mts and .59mts in north south and .53 mts in east west directions. On both sides of the entrance in the outer face pillar profile are shown. And near the left pillar profile the famous 'Parivadinidha' inscription is seen. This inscription helps us to assign the period of the rock cut cell to 7th century AD. The upper most citadel has a full ring like castle wall. It is a vast open area with a platform in the center. A canon is mounted on the platform. To the south of the platform is a small tarn with iron fence around it. The three concentric castle walls are huge with brick parapets. The castle walls are approximately 1.4mts width. The brick parapet walls are perforated arches, which might be the musketry vents. On the upper echelon ring the embrasures are seen which is the usual architectural feature of the forts. 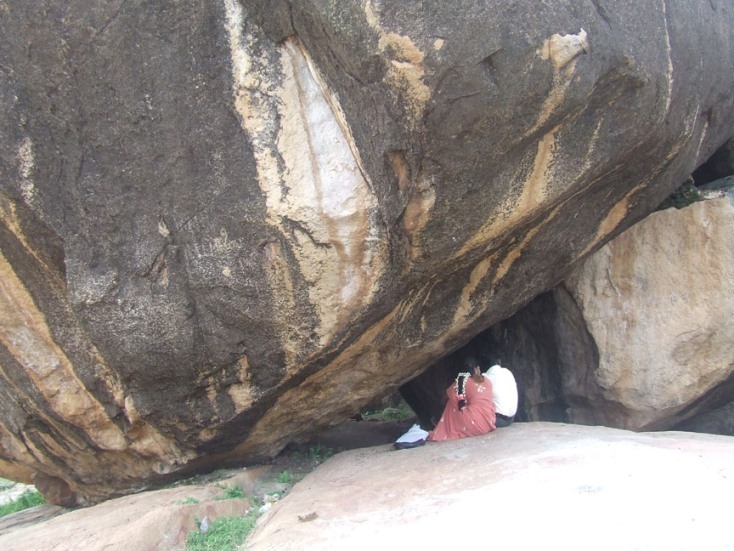 Thank you, dear readers in the forthcoming sessions we will see the Sathyagiriswara and Sathyamoorthy rock cut temples.